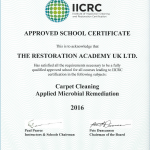 Home / News / The Restoration Academy UK Limited now an IICRC School!! On June 3, 2016,	Posted by Adam Jankowski ,	In News,	With Comments Off on The Restoration Academy UK Limited now an IICRC School!! In March 2016 The Restoration Academy was finally approved as an IICRC School. 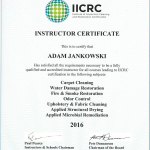 The first two subjects we have secured licences for are IICRC CCT (Carpet Cleaning Technician) and AMRT (Applied Microbial Remediation Technician). Other courses I am certified in teaching by the IICRC are taught through other schools. The first UK IICRC AMRT course taught by a UK instructor is scheduled for 20th to 23rd September 2016 at The National Flood School in Farnham in Surrey.